In order that the 'pin proximity' feature of Golf Quickscore+ may be used, the location of the pins on a golf course must first be configured. This is performed off of the 'Edit Golf Course' screen. Click the 'Locate Pins' button to display a Google maps screen. The map will be located according to the value entered for the golf course's postcode/zip code. If Google maps is unable to locate the course (and the phone has network access) then a town name, for example, may also be entered after the postal code to give the search more information. To set a pin location, zoom/scroll to a green and long-click the screen to bring up some crosshairs. 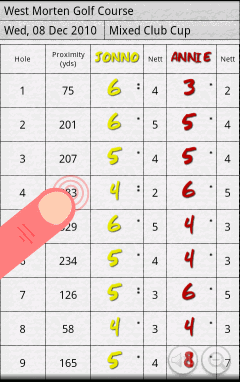 Drag the crosshairs until they are positioned over the centre of the green (or over the hole), click the 'Set Pin' button and finally, select the number of the hole to which this pin location belongs. A flag will then appear on the map at the selected position. If a pin location has been set incorrectly then follow the same procedure and re-select the hole number. The stored location will be amended. To start again from scratch, select the 'Clear All' menu option. On some occasions, the map will reposition itself when the crosshairs are brought up (the more the map has been scrolled, the more noticeable it will be). This is in order that Google Maps is able to more accurately map points on the screen to locations (Lat/Long) on the map. If the map is repositioned awkwardly then click the 'Cancel' button, drag the map to the desired position and long-click the screen to bring up the crosshairs again. The panel down the right-hand-side identifies with a tick, the holes for which a pin location has be set. 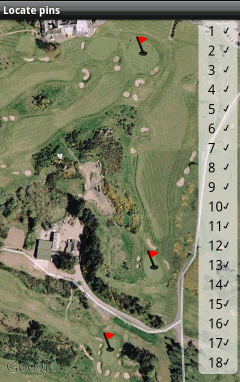 Clicking a ticked hole number will centre the map on the associated pin location. On the scorecard, tick the 'Show Distance To Pin' item within the Screen Layout menu option (or select the 'Show All' menu option) to display the column that shows your current proximity to each pin. The values in this column will update as you move. To avoid the need to select the hole currently being played, the proximities to all pins are displayed but, of course, only the proximity to the pin for the current hole is relevant (although the values for all holes should be accurate). If a question mark is displayed then the GPS receiver is still searching for your location (or has been switched off). A value of N/A means that the pin location has not been configured. When standing at the location of a pin, it is possible to set (or reset) the stored pin location by long-clicking the relevant proximity cell. The accuracy of the range finding within Golf Quickscore+ is wholly dependant upon the capabilities of your phone's GPS receiver and upon the strength of the GPS signal being received. It is also dependant on the accuracy of pin locations configured (which is subject to possible Google Maps discrepancies). Note that use of the GPS functionality on your device will drain the battery and therefore it is suggested that the range finding features be used conservatively. A Preference setting exists that may be used to reduce the frequency of the GPS updates. This will increase battery life at the expense of potentially waiting a little longer to get accurate proximity readings. Alternatively, the proximity column may be toggled on and off as required using the menu options. When the proximity column is not being displayed (and no other GPS feature is being used), the GPS receiver is de-activated.